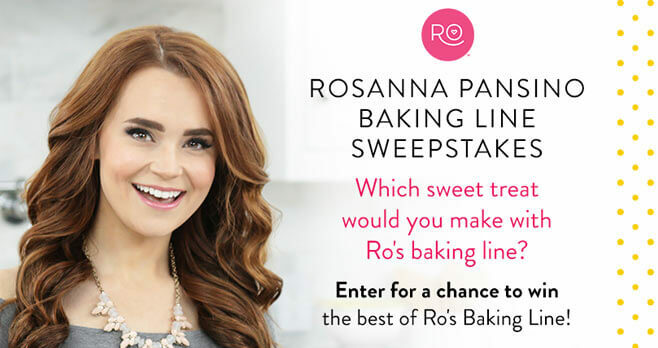 Visit wilton.com/rosweepstakes and enter the Wilton Rosanna Pansino Baking Line Sweepstakes by July 31, 2018 for your chance to win the best of Ro’s Baking Line. It’s your chance to win everything you need to make the sweet treat you want. Eligibility: Any legal resident of one of 50 United States or District of Columbia who is at least 16 years old at time of entry may enter. Promotion Period: The Sweepstakes begins at 9:00 a.m. CT on July 16, 2018 and ends at 9:00 am CT on July 31, 2018. Prize(s): Two entrants will each win a prize consisting of one of each of the following Rosanna Pansino products: half apron, oven mitt, cupcake liners (72 ct.), two Comfort Grip cookie cutters (poop swirl and mustache), cookie stamp, lollipop sticks (30 ct.), lollipop heart mold, wand pretzel mold, whisk, ball pan (6 in. diameter), 6-piece covered mixing bowl set, candy activity kit, cookie decorating kit (9-bit heart), swirl decorating kit, 12-cavity poop swirl pan, 6 in. round pan, 12-cup muffin pan, 6 in. square pan, and princess pan.